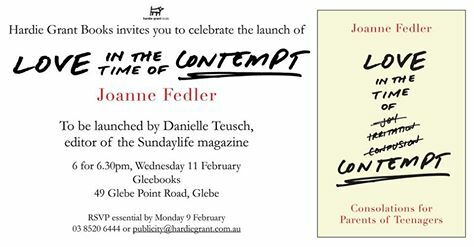 About three months ago, I had the privilege of being included as one of 200 “early adopters” for Joanne Fedler’s new book about to be launched in Sydney next month, entitled Love in the Time of Contempt , Consolations for parents of Teenagers. The idea was to assist the book in getting into the hands of a million stressed out parents and help it to “grow wings”. And I say privileged, because Joanne’s previous books and most notably, When Hungry, Eat, have made an enormous impact on my own writing journey and now here I am, writing a review on her latest work. And she has asked me to do this. What a great privilege. And so in the last 4 days since having received the pre-publication copy via email ( the first e-book I have ever read, being an avid e-book avoider and non-kindle owner) I have sat for long periods of time with my laptop on my lap (now see where the first syllable comes from) and devoured it like a dog with a bone. Meals have been missed and conversations with my children and husband stunted as I rushed to finish it and write notes to myself intermittently in between paragraphs about exactly why I love her writing so much. Joanne’s words flow off the page and float into my heart, encouraging me to think consciously and perhaps even question my own parenting principles while making me smile and nod in the process. She cleverly prompts thoughts and challenges ideas in her beautiful metaphoric style, reminding us that ” … a teenager is like rising damp: he or she has grown out of the environment in the home. Teens are not alien but organic, not separate from the family in which he or she has been raised but part of it –…”. She has reaffirmed for me why I am so wary of social media, stating it’s poison so brilliantly in that it “flattens the complexity of interaction, promotes anxiety and shreds self-esteem”. 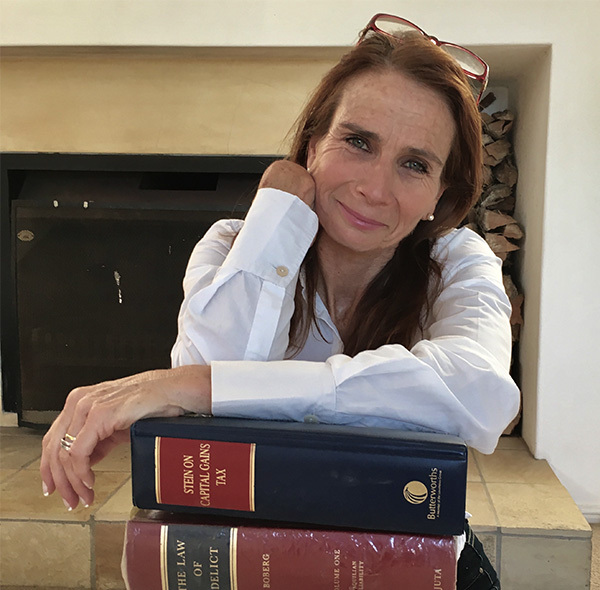 She challenges ideas and then offers valuable psychological research to substantiate a relevant response and in so doing, makes us understand why it is so important for us to “show them by example, how to object to injustice, how to negotiate, how to disagree, how to fight fairly and kindly, how to express gratitude and love”. She has reminded me why I don’t like sending an overly emotional child (or teenager) to be banished and given Time Out or left to deal with their own emotions but to be there for them and contain the feeling for them. ( I have two younger children too apart from similar aged teenagers) And she has left me wondering about my own ABC. (Her’ narrative is Always Be Connecting.) Love it. So while Joanne considers that Kate Shand’s book has been “one of the most powerful teaching tools” in her parenting journey, I have now firmly placed Love in the time of Contempt as a valuable yardstick in mine. I cannot wait for the hard copy and it will be placed next to my bed, after giving it to my hubby first and lent out to anyone who accepts me shoving it at them to read immediately! Joanne, I think you have lived well: you are useful, honourable, compassionate and have made a (BIG ) difference! Given that I too am not shy of expressing an opinion (perhaps similarly because of my legal, Jewish heritage) I must disagree with you in two respects. (a) I feel sad that you would discourage your children from studying law, citing as you do that there is no “happiness” there (though I bet my hubby would agree with you, having also studied law) since I truly believe that there is nothing more valuable that teaches logic, discipline and simply how the world works in terms of rights and obligations, and which I have no doubt has contributed to your logical, exciting and yet measured response to life- in fact you even state as much somewhere in a discussion with Jordan ? (no-one says you must be a lawyer but as a course of study, it is wonderful) and (b) I’m not sure about vaginal knitting and must agree with Shannon. I think that vaginas are strictly private assets and have only two specific purposes: for sexual pleasure and as a child birthing passage. Other than that, I don’t believe they should be utilized for any experimental art exhibition or as a knitting vessel. Somehow, it just seems to aggravate the notion that women’s bodies are free for public abuse in some way. Next post“Always be connecting” is my new motto but apologies if I don’t!